One of the most religious pilgrimage sites in India, Patna Sahib has a great sacred significance that entices the devotees from all across the world. It is also dubbed as Takht Sri Patna Sahib and a home of Guru Gobind Singh Ji. One can visit here to experience holy enlightenment. The two most famous gurus - Guru Shri Nanak Dev Ji and Guru Tegh Bahadur Ji also paid a visit to this religious shrine. Situated on the banks of Ganga River in the beautiful city of Patna, It was erected by Maharaja Ranjit Singh, the first emperor of Punjab. 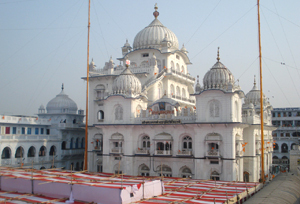 Patna Sahib has a beautiful history to reveal to its devotees. It is the place where Guru Gobind Singh Ji was born in the year of 1666. The tenth guru had stayed here for many years before leaving for Anandpur. And as a result, the place is in memory of the home of the tenth Guru, Guru Gobind Singh Ji. Like many other gurudawars, it was also constructed by Maharaja Ranjit Singh in 1666.However, the building got demolished owing to fire in the year of 1839. The maharaja ordered the renovation of the shrine; unfortunately he died before the completion. It is said that the first guru (Guru Nanak) paid a visit to this place enroute to the sacred land Gaya. He was a great philosopher and knew the significance of Pataliputra, which Hindus were failed to remember. The ninth Guru, Guru Tegh Bahadur also spent some time here during his trip to Patna. By Air: Jaiprakash Narayan International Airport in Patna is connected to all the main cities of India as well as foreign countries by regular flight services. One can easily reach the shrine by a car or a taxi from the airport. By Rail: There is a rail head called Patna Sahib perched in proximity to the temple. And it connects the holy place with main cities of the country. By Road: Patna is well connected to the major cities of India by roads. The tourists can also reach the sacred destination by private vehicles or by bus as the government buses are available from the cities situated close to the Patna Sahib.